A vending machine sells food, drinks, tickets or other goods automatically. A vending machine is a machine which dispenses items such as snacks, beverages, alcohol, cigarettes, lottery tickets, cologne, consumer products and even gold and gems to customers automatically, after the customer inserts currency or credit into the machine. Place a node where the machine is located, with amenity=vending_machine. operator=* Entity maintaining the machine, and refilling it. brand=* Brand of product being sold. network=* Usually used when mapping public transport related selling machines. ref=* The machine's unique identifier. payment:*=yes/no Could be of good help to indicate. wheelchair=yes/no Whether the vending machine both can be operated from a wheelchair (height of coin insert and display) and is accessible without stairs. covered=yes/no Whether the vending machine is under a roof or inside. Also see taginfo for the most common semicolon separated ones. 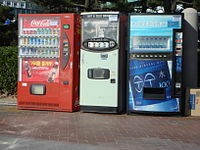 A vending machine is a machine which dispenses items after the customer inserts money. See amenity=vending_machine for more information. vending art A vending machine that sells art. vending bicycle_tube Vending machine for bicycle tubes. vending cigarettes A cigarette machine is a vending machine that dispenses packets of cigarettes. vending elongated_coin Elongated coins are coins that have been elongated (flattened or stretched) and embossed with a new design with the purpose of creating a commemorative or souvenir token. vending parcel_mail_in You can drop off your parcels there. vending parcel_pickup You can pick up your parcels there. vending stamps A post stamps selling machine. Added because of an idea in the discussion. In that case it would not make sense to give more information as this could lead to problems of assignment of that data as the user might mix them up with the location itself. Tag descriptions with status "approved"
This page was last edited on 7 April 2019, at 07:47.